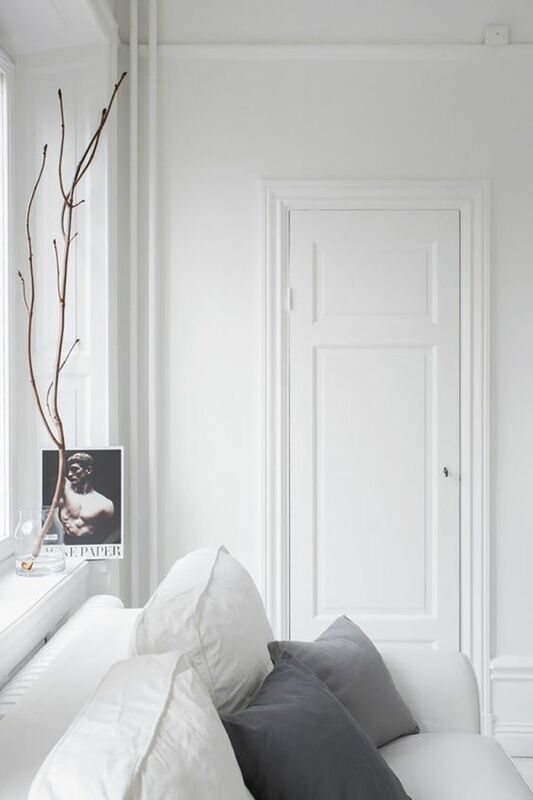 The question I am asked the most, either through this blog, or when I am working with clients, is ‘which white should I use?’ Decorating with white colour palettes is very popular for all styles, whichever country you are in. Whether you prefer an Australian Coastal or Country style, an East Coast American Hamptons look, the ever popular Scandi style or a slick inner city urban look – you will be faced with the same dilemma – which white should I choose? I have already written an in-depth article on my blog about how to select the right white but I thought it would be really useful, from the experience that I have, to just list the 5 biggest mistakes to avoid when selecting white. 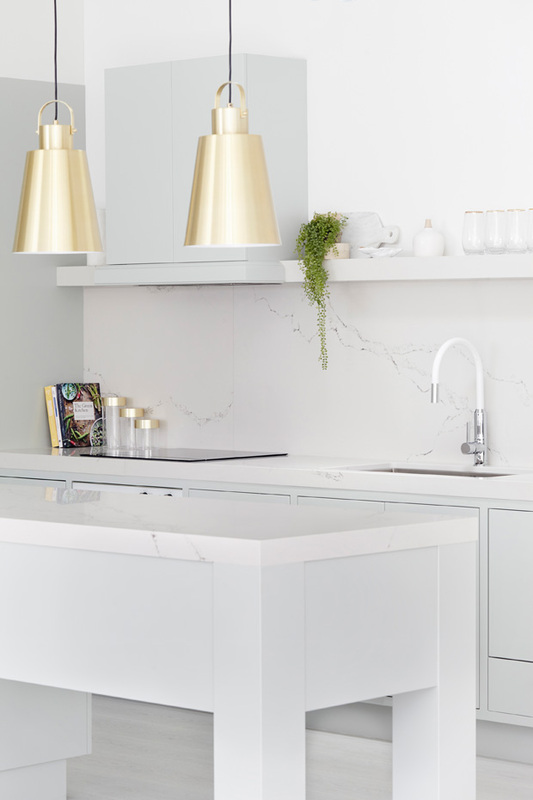 This beautiful kitchen below from Three Birds Renovations demonstrates how great white looks when you get it right. Looking at the white sample in isolation. You must view your whole colour palette as one, so pull together all the finishes that you plan to use for your new scheme. Start with the floor as this is the base for your scheme. Then consider your kitchen cabinets – if these are new, are you using a melamine, in which case your selection is a little more limited, or do you have a two pack polyurethane painted finish that can be any colour? Now consider your benchtop, splashback, pieces of furniture you already have, for example sofas, chair, upholstered bedhead etc. Consider rugs and accessories that you either have to work around or would like to purchase. 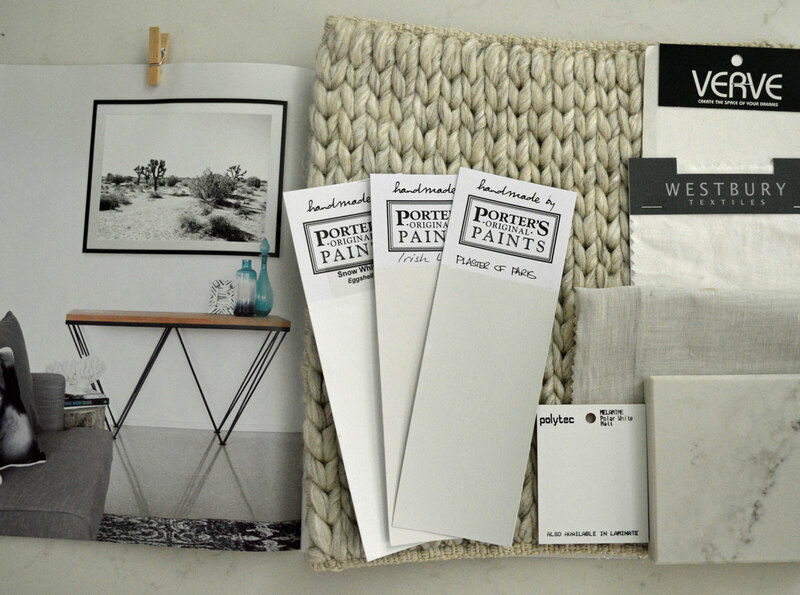 Only make your selection of white paint once you have all of these items together as it is much easier to see the flow of the palette as a whole rather than just choosing a white that you have seen work in a friend’s house or magazine. Viewing the sample in a small colour chip. You really can’t see the underlying colour when you view the sample in a small amount. All neutrals will have a base and you have to see the colour in an A4 size or larger and view this against a pure white background – for example a plain piece of paper, to really appreciate the underlying colour. You will be surprised how the creamy yellow tones, grey or blue etc will jump out at you in a way they wouldn’t when viewed as a small paint chip on a colour card. Using the same white throughout without varying the textural finishes. This can leave you with a scheme that works together colourwise but doesn’t work for the room as it is too flat. If you use just one colour or tone, ensure that you introduce different finishes. For example if you have brick feature walls, you can simply paint these white and then use the same white on a plastered wall to great effect. Consider your soft furnishings and rugs and use various layers of texture to create interest. This way you can have a completely white room that will look great. With such a simple palette, don’t underestimate the impact that introducing another colour will bring – for example just a touch of black in a scheme like this can look fantastic as the strong tonal variation is very striking. 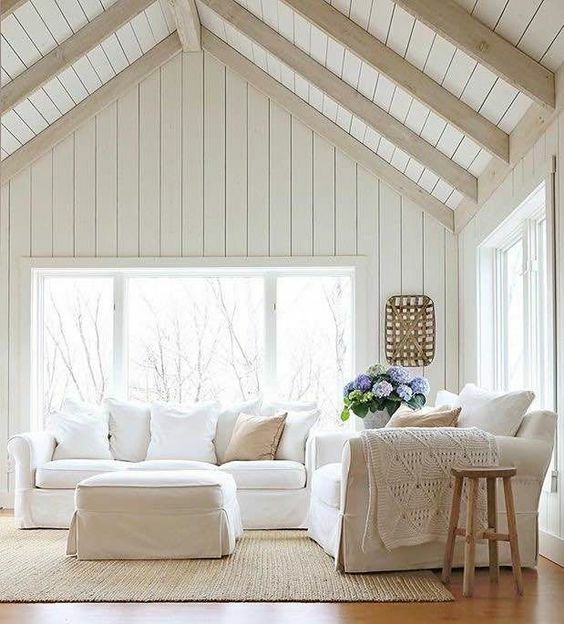 Using a cool white palette in an area of your home that tends to be cold and doesn’t receive a lot of natural light or a warm palette in a hot and sunny area. Ensure that you consider the aspect of the space before you select the colour palette – you may love cool, almost grey colour palettes but the effect could be awful if the aspect is not right. You can still achieve a cool, fresh look, you may just have to adjust the amount of grey. Don’t feel that you have to keep your entire colour palette either warm or cool – just go with one predominantly to create a theme but don’t be afraid to mix it up a little – remember opposites attract but as far as interiors are concerned they are best suited in an 80/20 mix. Not considering your ceiling colour. A ceiling white will often include a touch of grey or even blue and I find that this can sometimes throw the entire scheme. You can follow all the rules above and then ruin it by not considering the ceiling and cornice. Remember that in addition to your wall colour meeting the ceiling, kitchen cabinets will also often reach to the ceiling and therefore the white you choose for walls, cabinetry, internal doors and trim must relate to this all important area. A picture speaks a thousand words and you can see the difference between this cool white palette and the warm colour palette below. 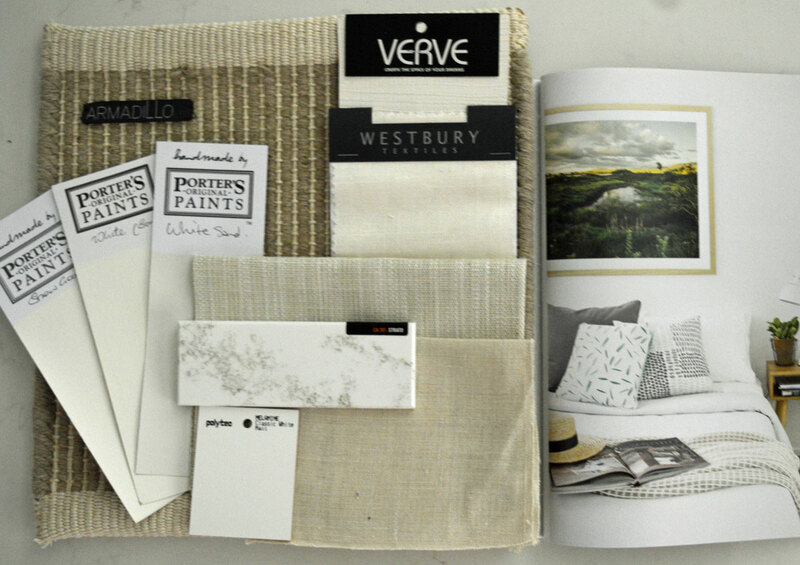 You can also see how beneficial it is to put everything that you plan to use together, including inspiration from magazines of what you would like to achieve for your home. Lovers of the modern grey trend can see from this colour palette that although your room aspect may demand a warmer colour palette, you can still introduce some grey, just ensure that the basics are warm – remember that 80/20 rule for opposites. For example, a warm timber frame with a lovely warm grey throw balances the scheme nicely. The benchtop sample too has beautiful warm gold tones running through it but is still essentially grey. A beautiful cool simple living room scheme. Slip wash covers that can be removed for washing or dry cleaning are a good idea here! A gorgeous warm living room scheme – I could quite happily spend an afternoon in this room. There are the white slip covers again – a must for this type of look! And remember what I said about varying textures to introduce interest in a simple colour palette – this beautiful image demonstrates the point perfectly. 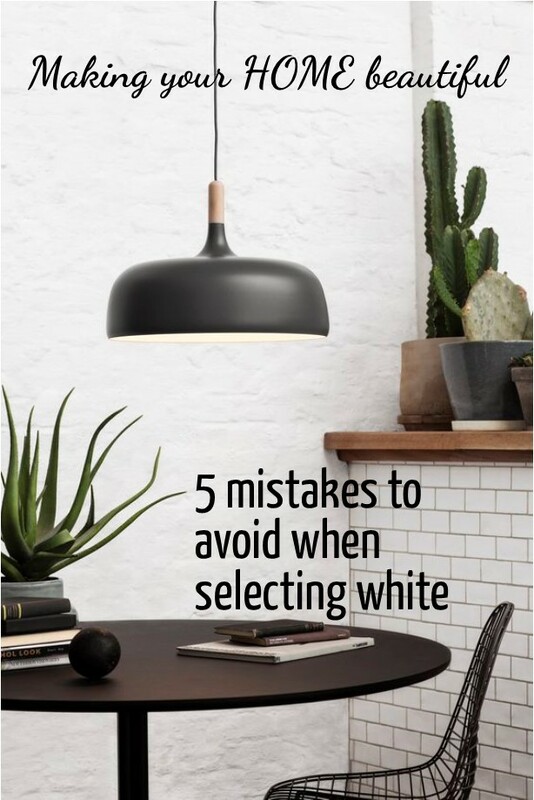 I hope that by highlighting the 5 biggest mistakes people make when selecting the right white that you now have more confidence when choosing your colour scheme. Remember not to work against the environment that you have, rather embrace it and find the right white to complement it, so that the space is one that you love to spend time in. Hi I love your ideas! Could you give me some advice about white please? I have white kitchen cabinets with frosty carina bench and splash back and stainless steel appliances and kick boards, and 2 beautiful grey lamps above the breakfast bar from Norman Copenhagen. Now trying to decide on s white for the ceiling , walls and trims. The floor is a warming walnut but not throwing very much red. Do you think that Dulux snowy mountains would be a good pick? In half or quarter? And we have chocolate coloured exposed beams on the raked ceiling , will these match with a ceiling white??? Thankyou for your advice!